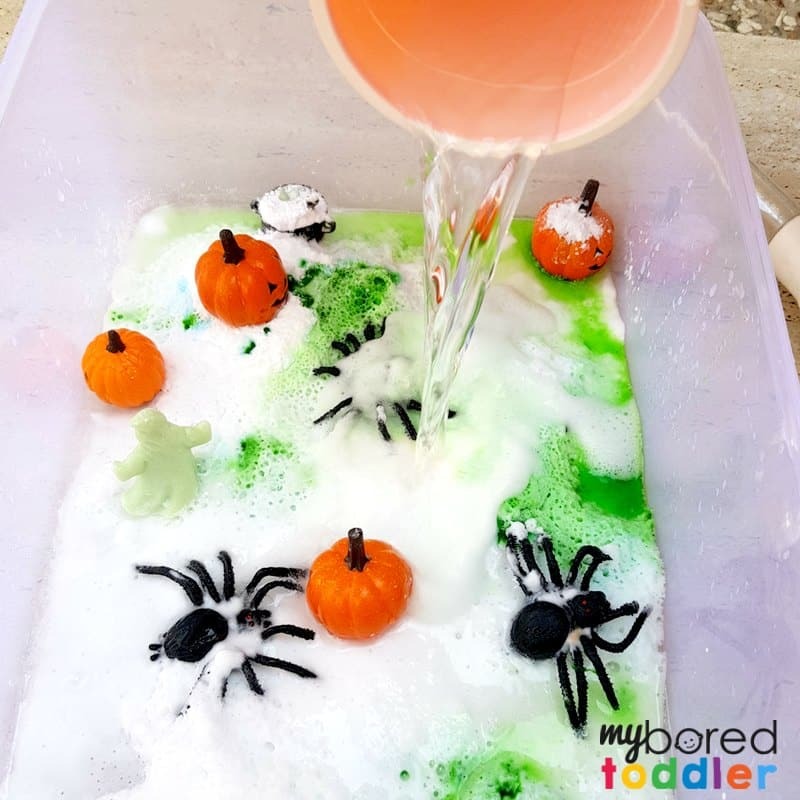 We’ve been having lots of fun with our Halloween crafts this week, and since our colorful fizzing sensory bin was such a hit we thought that we would add a Halloween version! 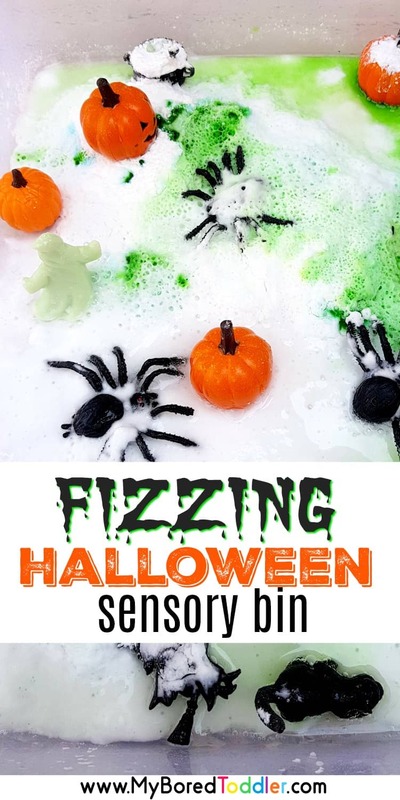 This Halloween fizzing science sensory bin is simple to set up and the kids LOVE it! 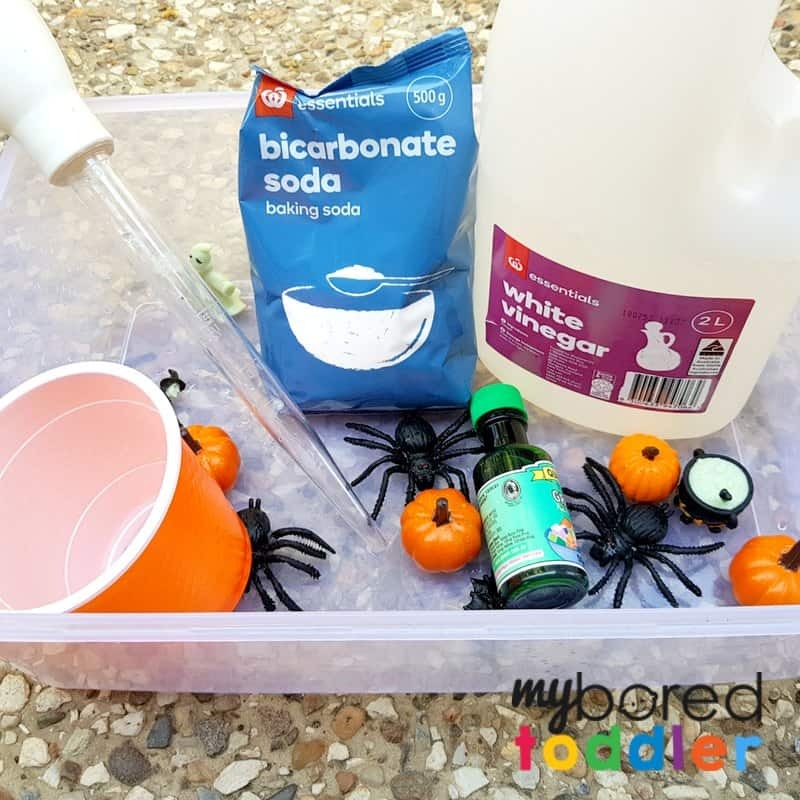 Last year I set up a Halloween fizzing cauldron experiment (a lot more elaborate than this one!) which was so much fun, but this year I though I would keep things a lot simpler! This activity is great for individual or small group play. 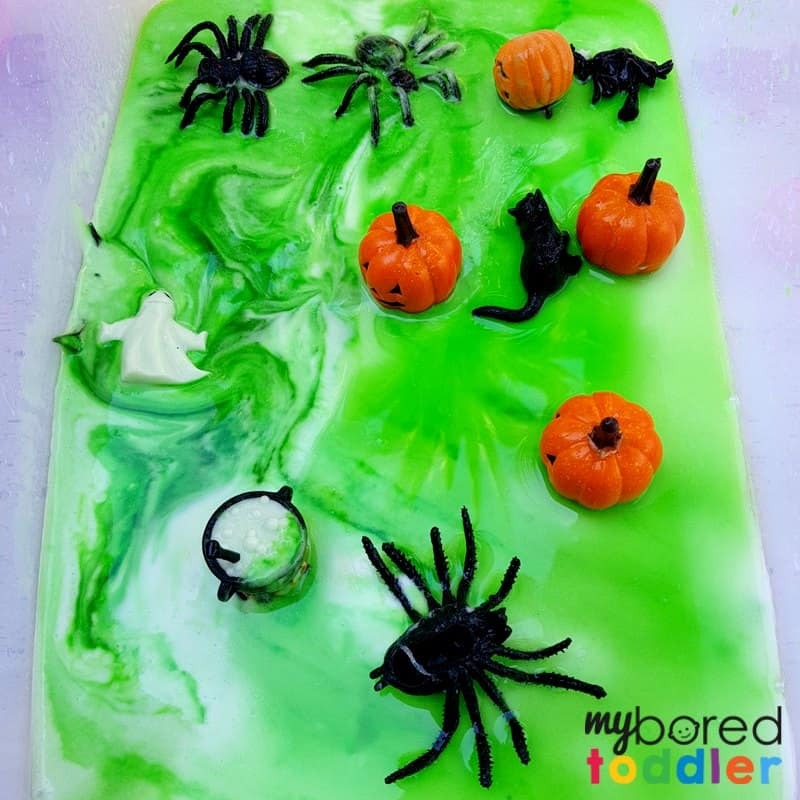 Food Coloring – we used Green. I only used one color for this one on purpose as too many colors mix together to make brown! 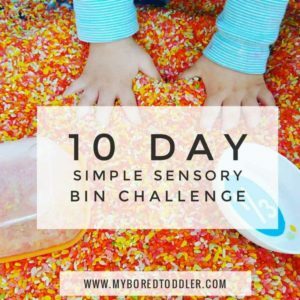 If you want a more colorful fizzing sensory bin try this one. 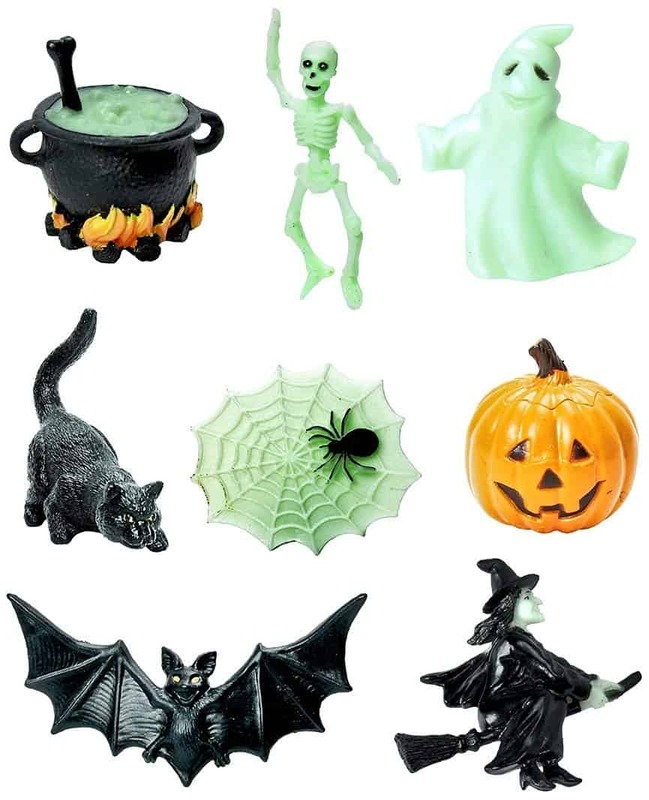 Halloween Figurines – we used the Safari Ltd Halloween Glow in the Dark Toobs I really like these toys as they last year after year, rather than the cheaper plastic ones that tend to break easily. 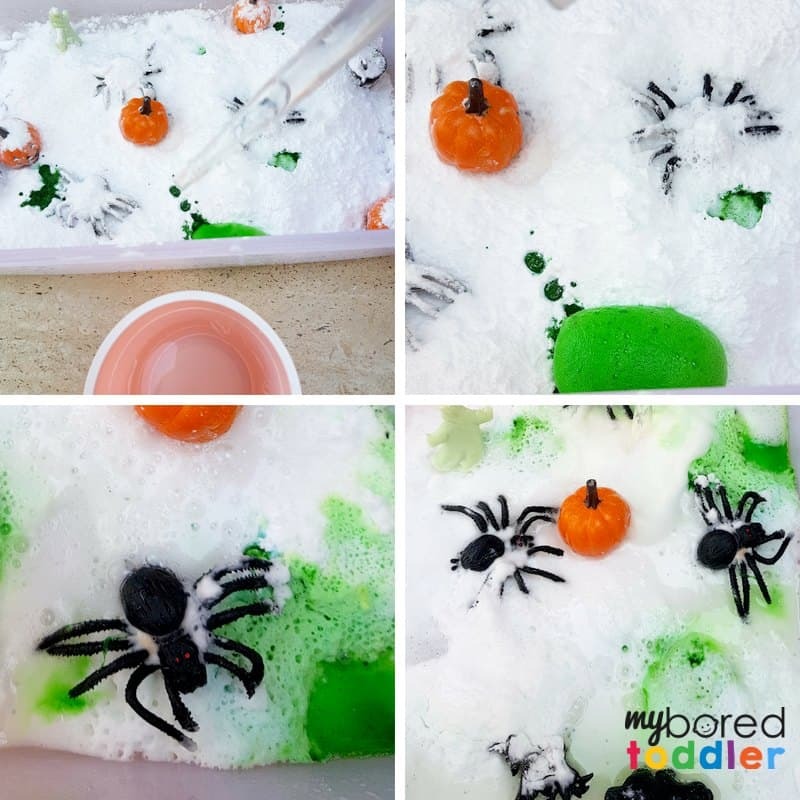 I also used these last year in this Halloween sensory bin that I created for Fun with Mama. Turkey Baster – You can use medicine droppers, but a turkey baster like THIS ONE is so much easier for little hands. 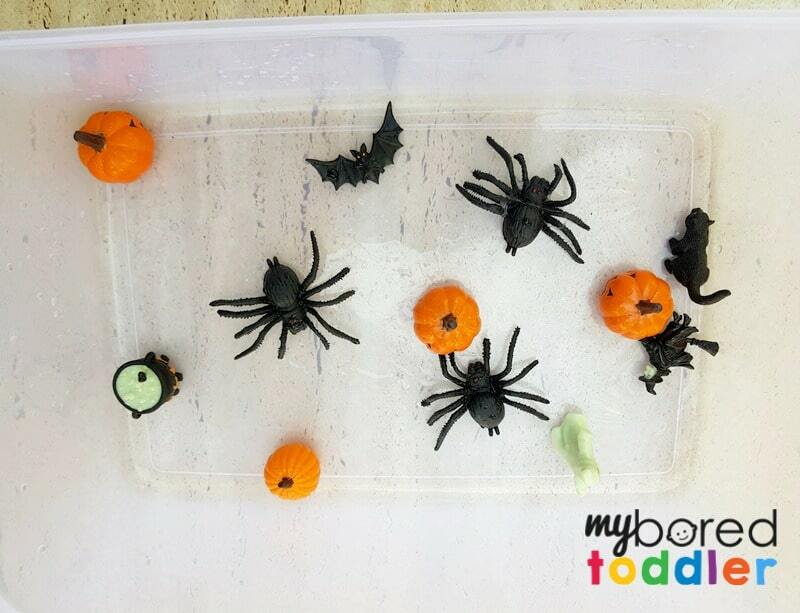 Place your Halloween toys on the bottom of the container. 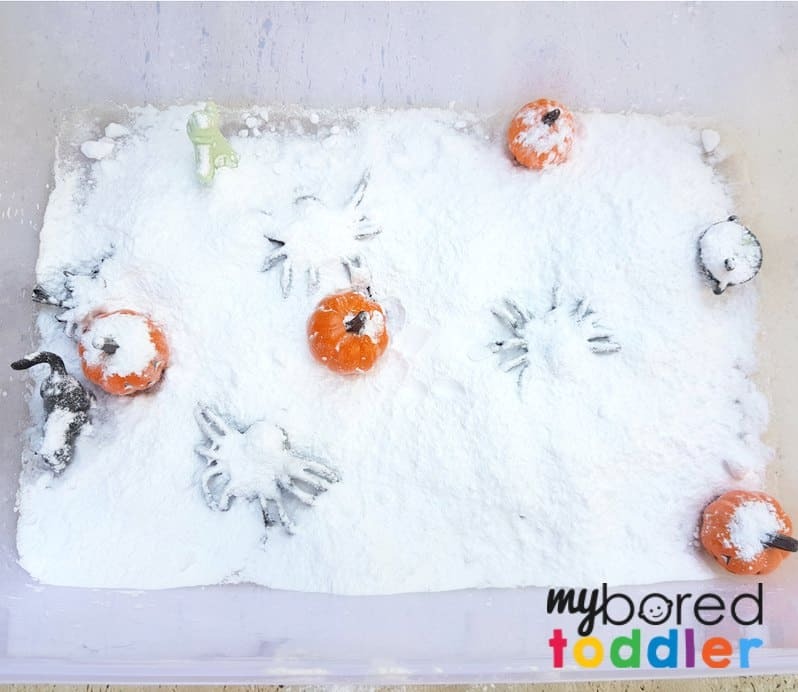 I deliberately put them on the bottom so that it would be a surprise when the baking soda fizzed away to reveal all of the toys. 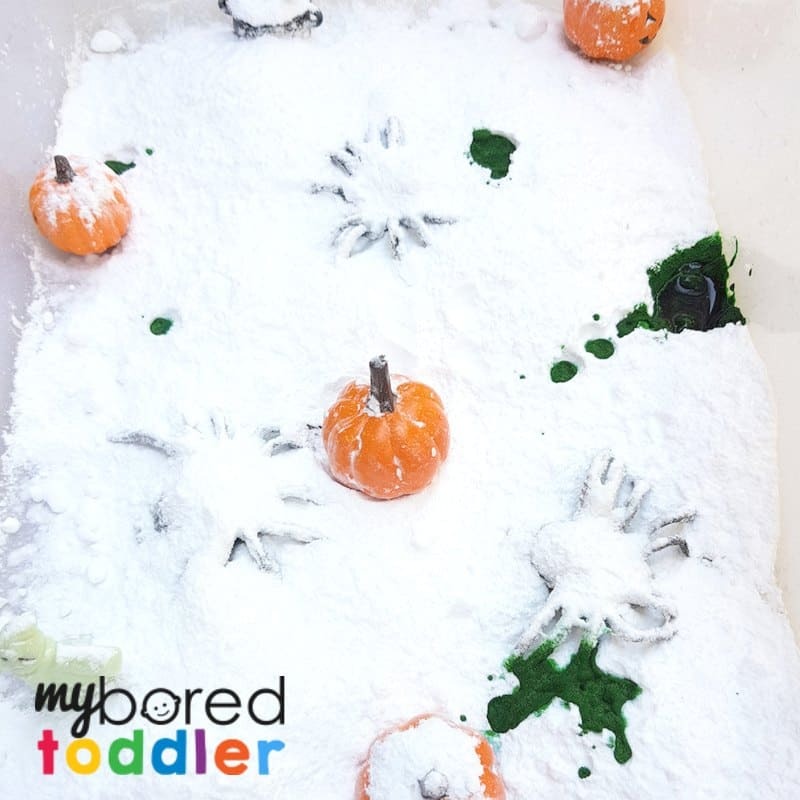 Add a few drops of food coloring around the sensory bin. My aim isn’t to have the whole container turn green (not straight away anyway) so I have only put it in a few locations. The idea is that it’s a surprise when those areas fizz green. Fill up your cup or container with vinegar and you’re ready to go! 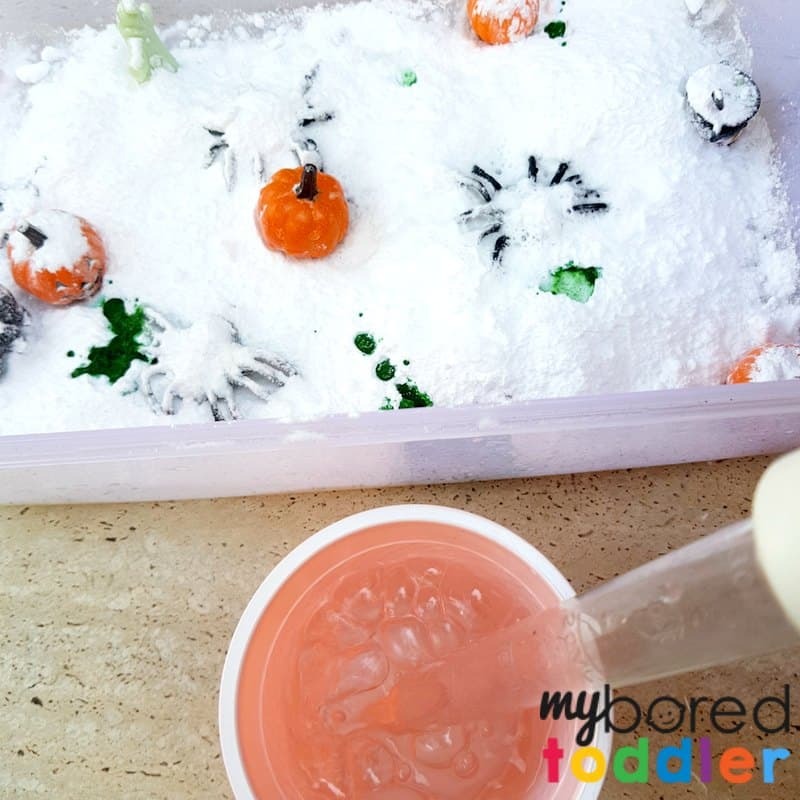 How my toddler played with their fizzy Halloween sensory bin! I started off by reminding her of how to use the turkey baster. Younger children will need a bit of help with this part, but the older ones should be able to do it themselves by the end. 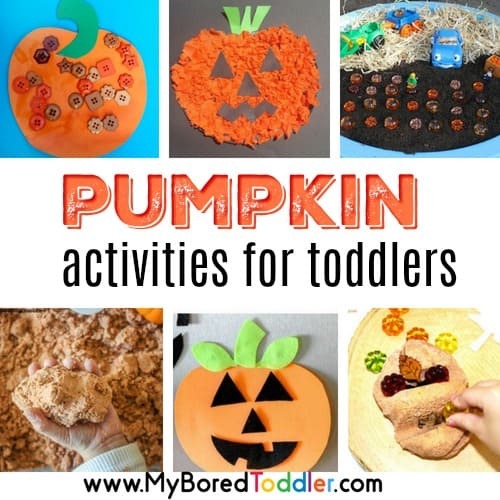 It’s a great way to develop fine motor skills so we try to use it in a lot of our activities. If you want to extend the play with this tool try our simple water play activity. I don’t like to make ‘rules’ when we play with our sensory bins, but there’s nothing wrong with a bit of demonstrating. My daughter really wanted to tip the whole cup of vinegar straight into the container, but I encouraged here to hold off until she had used the turkey baster first. She really enjoyed that part and then ended up waiting till the end to use the cup! 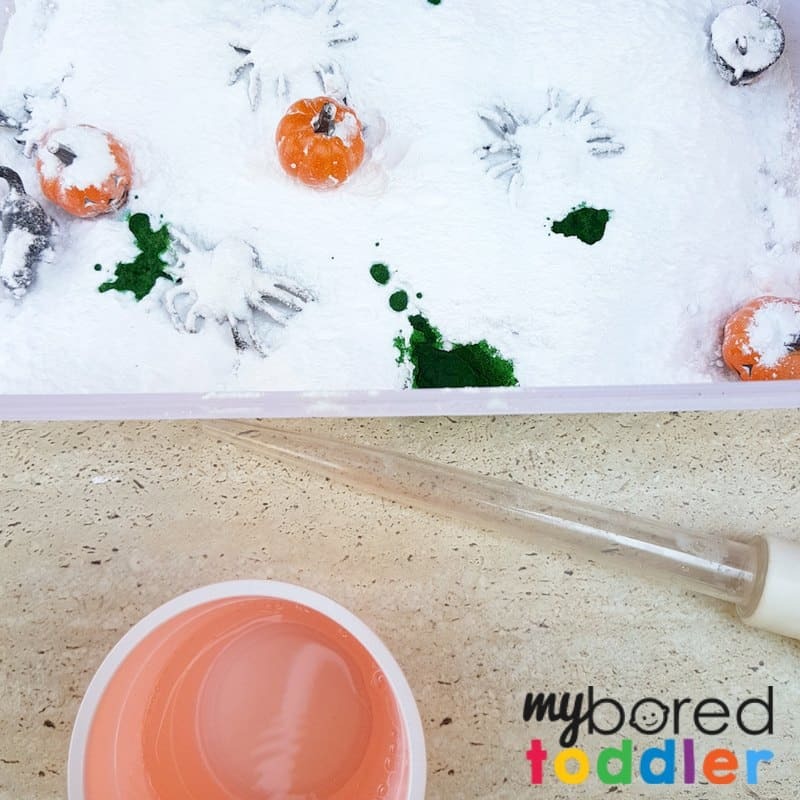 It was lots of fun watching her see what happens when the vinegar hits the baking soda. There were different reactions depending on the amount of vinegar we used, and it was lots of fun when we put the vinegar on the food coloring. Eventually we did end up tipping in the whole (refilled) cup of vinegar -that made a pretty good fizz!! After we had fizzed most of the Halloween toys, my daughter decided to use the vinegar and ‘wash’ the toys. It’s always great when play is extended and is child led. You never know where an activity will end up! After we washed the toys, she decided to mix up all the baking soda and vinegar which ended up making a very bright green color which added another element to our play too. Lots of pretend play continued. 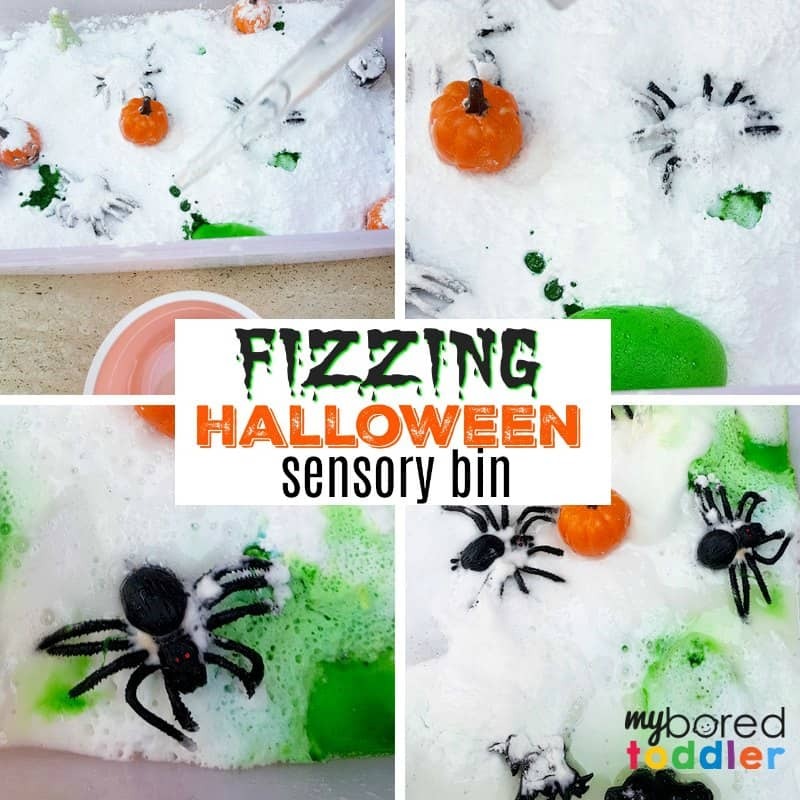 I would love to see how your toddler or preschooler played with their Halloween Fizzing Science sensory bin. 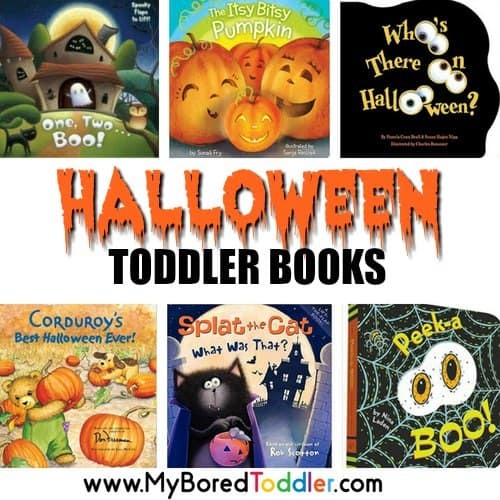 Share a photo in our Facebook group or or Instagram (follow @myboredtoddler) and use #MyBoredToddler so we can all see! 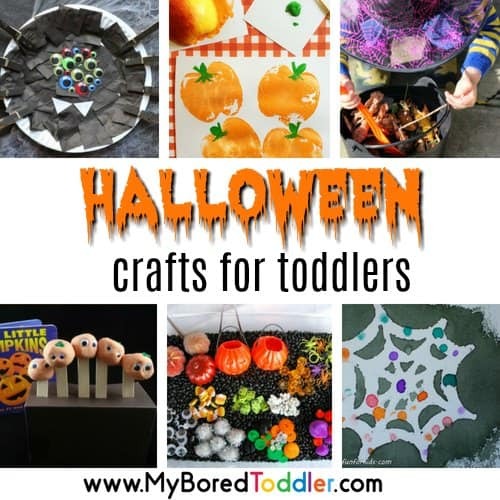 You can also follow us on Pinterest or Facebook for more great toddler activity ideas. 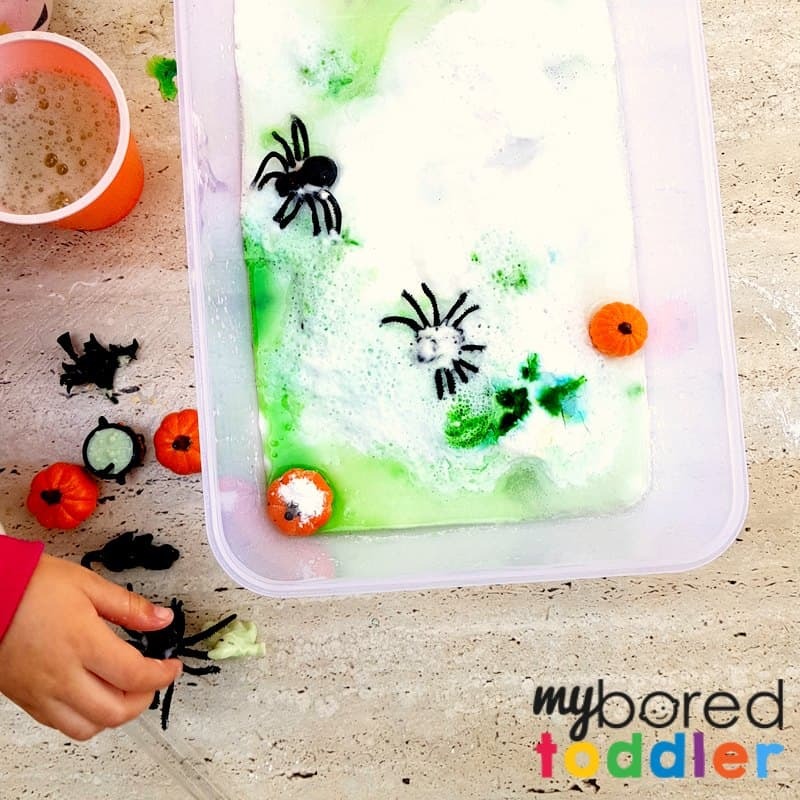 If you enjoyed this Halloween fizzing sensory bin, you might like these other toddler Halloween Activities.